An interesting fact about me that some of you may not know is that I received a bachelor's degree in 3 years! 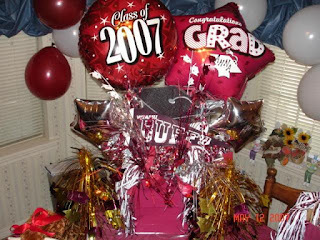 I graduated from West Texas A&M University on May 12, 2007 with a degree in Fine Arts! 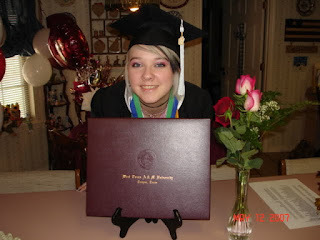 When I graduated from high school I didn't have any college credits. But I took summer school every summer and even took classes during winter and spring breaks. 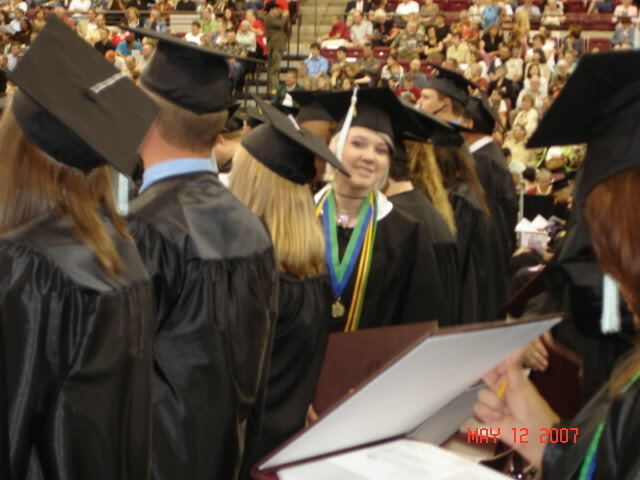 It was a lot of hard work, but I was determined to graduate early. I was inspired by my brother, who also finished in 3 years! It was great because I was able to go to cosmetology school sooner and begin my career as a hairstylist. That's always been where my passion is. 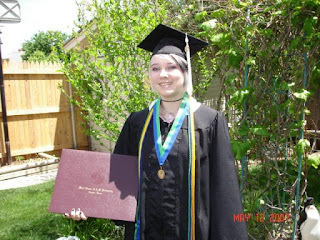 But I am very proud to have a degree because education is super important to me. 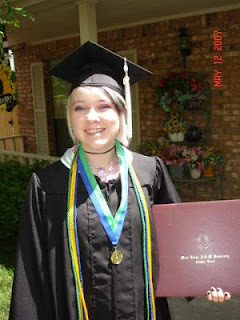 I graduated with Honors, too, and was on the Dean's List each semester! 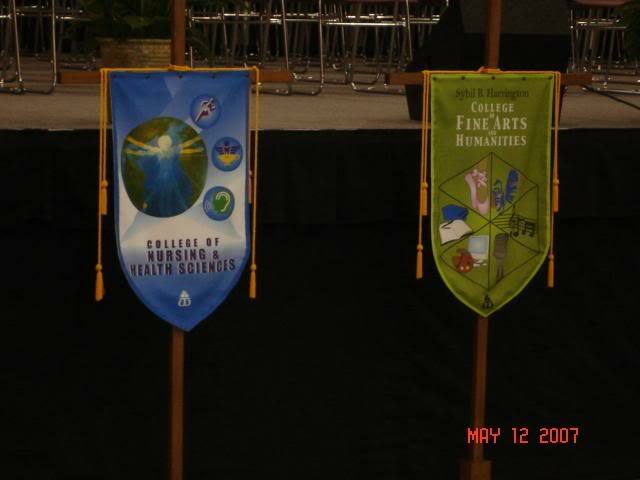 The Fine Arts and Humanities banner is on the right. It was a really fun program to be apart of. 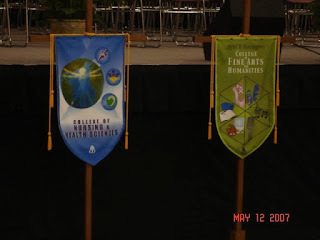 I'll never forget that the CEO of AT&T was our guest speaker at the ceremony. He held up a tiny device and said "The only thing you will remember about my speech is that I showed you the very first iPhone." And sure enough .. that's all I remember.. But how cool is that?! It wasn't even for sale yet. 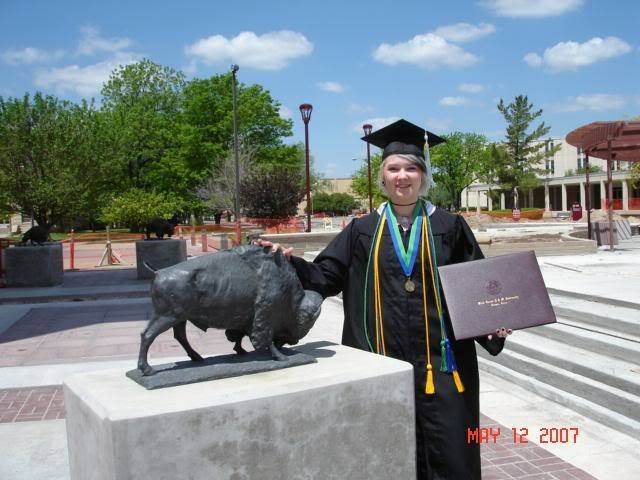 At WTAMU the mascot is a buffalo. My family surprised me with lots of balloons and decorations that day! 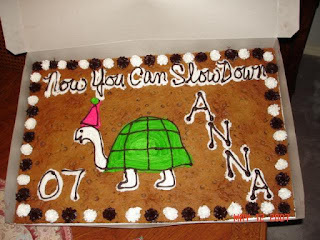 I also got this amazing cookie cake. 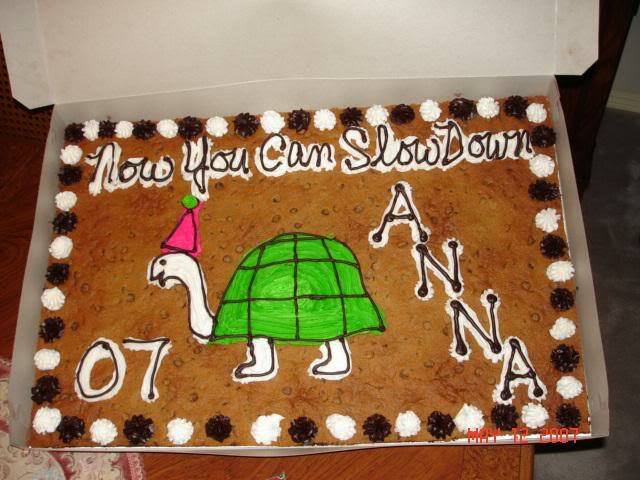 It says "Now you can slow down, Anna" .. That's because I took so many classes back to back to back to back. Since I didn't blog 6 years ago, I figured now is as good as time as any to make a post about it! I can't believe it's been 6 years already. I have accomplished so much. I am extremely proud to show off something I worked so hard for! That was really awesome. Makes my heart feel some kind of weird(might be fear, I'm not sure). You should feel proud, that really is quite the accomplishment. What made you want to post this now? That's such an awesome accomplishment! Congratulations! It's wonderful that you got through college so quickly and then went on to study cosmetology and then ultimately manage your own salon! You've accomplished so much in such a short amount of time! Be proud! Also, I wonder if at the time everyone was wondering, "An iWhat? Who is this guy? We'll never hear of the iPhone again after today." 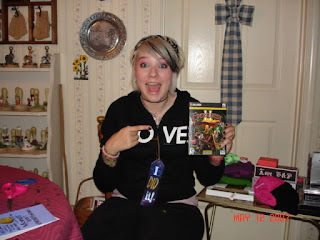 That's pretty remarkable that you have a picture of you opening Everquest II.... who would have thought you'd still be playing it so much after all this time? A belated congratulations on your accomplishments! I've seen two nieces graduate this past week and I've been contemplating going to school myself. At the age of 45, widowed, and with a 3 yo daughter, I think that it's something I need to do. Granted, I got an education through the Navy, but there's no paperwork showing what I did. 25 years later, I can still go back and fix a radio or a radar, but no documentation saying that I can do that. 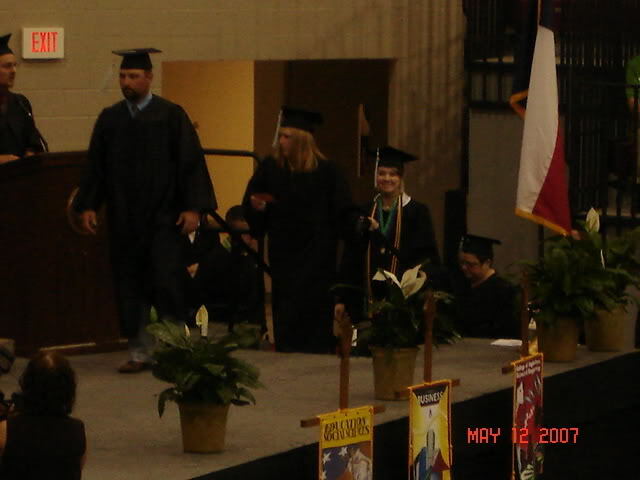 It's one of those situations where I've got the experience, but I don't have the diploma. But after seeing my nieces go on their merry ways, and then seeing your blog post, I'm beginning to think that it's about time. Congratulations on your determination and accomplishments. You probably get the surprised look from clients and friends who never would have thought you had a college and cosmetology degree. You certainly look amazing in all of your photos. It's good to read your post about this and possibly encourage others that anything is possible. You seem to excel at everything you do. Once you mentioned that when you grew up you wanted to be a snow cone maker. Check! A smoothie about now would be great! Now your hair has the cotton candy/snow cone look! Will continue to read your blog and follow your adventures. 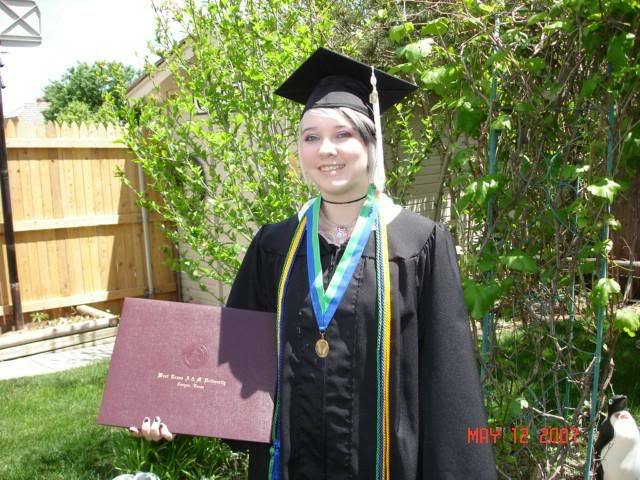 I actually didn't start my college carrer until two years ago because I wasn't ready right out of high school. I have my A.A. and this fall I'll be entering SF STATE to get my bachelor's degree. Here's hoping I can do it in two years! Great story! Thanks for sharing! !